63 yr old female with the history of severe weight loss (40kg – weight now 71kg) and vomiting of food directly after meals for 8 months. The symtoms have been getting worse the 2 weeks prior to admission. 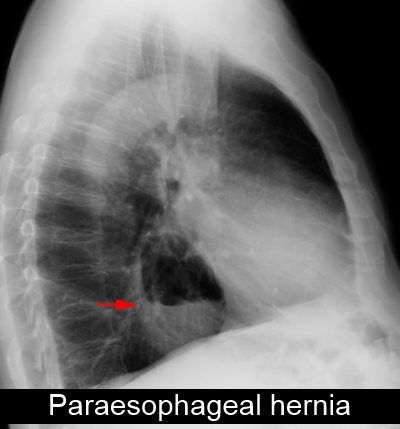 Gastroscopy was difficult, but a normal oesophagus was seen. In the stomach was food, and it was difficult to distend with air. A large ulcer was seen,but localisation of its position was difficult. Barium meal revealed a large paraesophageal hernia with organo-axial volvulus. Obstruction was noted just distal to the EG junction as well as distal to the pilorus. At surgery the whole stomach was basically in the chest, but it reduced relatively easily.Gastrotomy was done to inspect the ulcer , and a large duodenal ulcer (3x3cm) was seen. The stomach did not have a ulcer. We did a gastro-enterostomy and vagotomy as we were afraid of having problems ( anastomosis, leakage, stenosis) with the duodenum if we did a gastrectomy. The hernia was closed without a anti-reflux procedure. 1.Would you have added an anti-reflux procedure ? 2.Your opinion about the vagotomy & gasto-enterostomy. 3.When you eradicate H.pylori in this patient, will you add a proton-pump inhibitor to the antibiotics if you already did a vagotomy? I would not have added an anti-reflux procedure. I would test for H pylori before treating. (Although it sounds like in South Africa, the likelihood of a positive H pylori is high enough that it might be more reasonable to just treat for H pylori). I think the proton pump inhibitor is supposed to be bactericidal or bacteriostatic for H pylori–that that is its rationale for use as part of an H pylori eradication protocol. Although it is nice to have the benefit of pre-op manometry, I would probably have added an anti-reflux procedure in this case. I don’t think it was necessary since the ulcer was secondary to stasis and as I read your posting she did not have gasrtic outlet obstruction. I think I would since I believe from a previous posting that the proton pump inhibitor has a direct effect on the bacteria independent of the raising of the pH. > 1.Would you have added an anti-reflux procedure ? No. Reflux is not a problem in this disease. By definition, the GE junction is in its normal anatomic position, so reflux is rare. Reducing the stomach and fixing the (true) hernia, is all it takes. > 2.Your opinion about the vagotomy & gasto-enterostomy. This operation is as good as Vagotomy and pyloroplasty. The results are the same, and both are often grouped together as vagotomy and drainage. I am not particulraly fond of either. They have similar or perhaps slightly lower rate of recurrence as HSV, and similar or slightly higher rate of chronic complications (dumping diarrhea) as vagotomy and antrectomy. It seems to me that to choose V&D in this day and age, is to accept the worst of both worlds. In contrast, either HSV or V&A are useful operations. One gives low recurrence at the expense of a modest rate of late compliations; the other gives few complications at the cost of a high recurrence rate. There is a place for V&P if you want to escape the belly in a hurry, but this does not seem to be the case here. In this case, it is not at all clear that the ulcer needs any sort of operative Rx, but I realize that it is hard to resist doing an ulcer operation once you are in the belly. Under these circumstances, I could not justify any resective procedure, and if I were to add an ulcer operation, it would definitely be highly selective vagotomy. One can make a case for adding HSV to this patient, on the ground that it will cure the ulcer most of the time, and will not add anything to the morbidity, or even the cost, of the operation. > 3.When you eradicate H.pylori in this patient, will you add a proton-pump inhibitor to the antibiotics if you already did a vagotomy? I don’t know, and would like to see the opinions of others on this issue. Is it necessary to give any medical treatment at all? Afterall, we used to cure the greatest majority of these patients with surgery alone. Eradicating H. pylorii may reduce the recurrence rate, but I don’t think anyone has data to back up that statement. We should remember that in the PHP era (pre-helico..:-)) medical treatment had >80% recurrence rate. eradicating HP made a big dent in this number. I am not sure what it would do to the <10% recurrence rate of V&D. Nice case. I was interested as to whether you have any evidence that gastro enterostomy has a higher morbidity than partial gastrectomy. With such a huge ulcer its virtually transected your stomach for you – all you have to do is to complete the cut and already there is your distal resection margin.